If you don’t have children or you’ve never interacted with any, then you won’t understand that these sentences simply translate to asking a child if he wants some water (wawa), if he is hungry and wants food (num-num) or that it is time to sleep because it is time for bedtime (beddy bye). These are examples of baby talk, the oversimplification and other nonsensical words that adults often use when speaking to young children. Baby talk is a language all of its own, something that many child development experts have recognized and parents have been using for ages. It is a way that adults exclusively speak to babies and young children that simply can’t be avoided at times. After all, it’s hard to keep a serious face when an adorable baby is cooing and ahhhing to your every word. 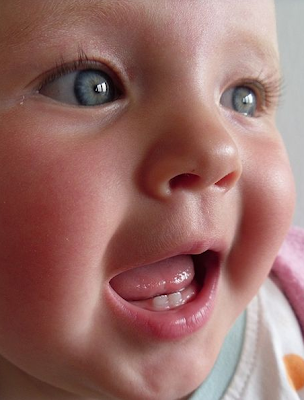 The sight of a cute baby is sure to send any grown up into wide smiles and tons of gibberish. The intonation of words becomes different, with the speaker often using a high- pitched voice, and many words and syllables are often repeated. Vowels are often elongated and the parent or caregiver often uses a singsong voice when speaking to the baby. All this is done in the hopes of producing a smile on the baby’s face, a hearty kicks or any affirmation that the young infant or child understood what the person said. Other ways that adults speak in baby talk is in the simplifying or abbreviation of many words. For example, it’s not uncommon to hear the term ba-ba used to refer to the baby’s milk bottle. There is baby talk to refer to the many nouns, verbs and adjectives in language. 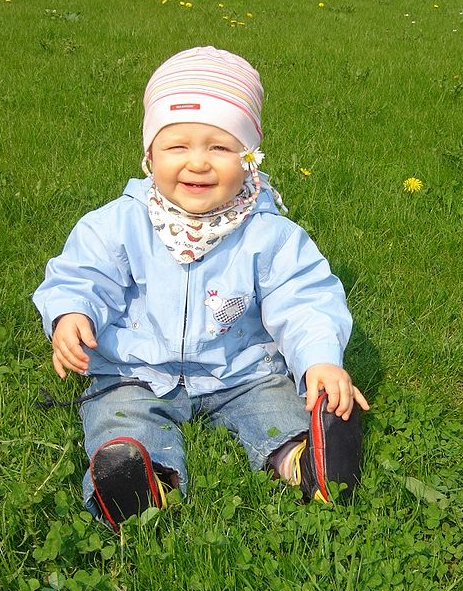 Parents use baby talk to refer to animals, food items, activities, body parts and even bodily functions. You won’t hear many adults using scientific terms when talking to a baby or referring to his different body parts. You will however, hear words like, pee-pee (urinate), poo-poo (defacate), blankie (blanket), owweee (for something painful or something that hurts) and num-num (yummy food). Grandma becomes na-na while dinner can be referred to as din-din. Made up words is another aspect of baby talk. This is why some families may have their own version of baby talk that is passed down from generation to generation. It’s also the reason why many children speak the way they do – it’s because it’s what they heard as babies and toddlers. If an adult refers to the family dog as doggie, a horse as horsie, pig as piggy and milk as milkie, then it’s highly likely that the child will keep using these words as he grows into toddlerhood. The use of made-up words is perhaps why some children end up with some funny sounding nicknames, with syllables of their names often repeated or the last letters of the name changed to make it more cute sounding. Mark can evolve into Markie Elizabeth can become Bethsy and why Margaret is Maggie. It’s quite interesting to see how the most serious of adults gets reduced to speaking in baby talk. This manner of speaking to babies and toddlers is also called caretaker speech, or infant directed speech (IDS). Other terms used to describe the way adults speak in a cooing pattern to babies and young children is aptly called motherese or parentese. The way adults and child caregivers speak to babies and toddlers is known by many terms. Sometimes, it is also called mommy talk, as well as daddy talk, since it is often the parents of the child who can be heard speaking this way when interacting with their baby. However, baby talk isn’t exclusively limited to the baby’s parents or direct caregivers. Anyone who chances upon interacting with a baby can often be heard speaking in a singsong voice to the young infant. In many instances, adults simply can’t help themselves be reduced to speaking in baby gibberish. There’s something too cute about young babies that makes adults want to try and speak at the baby’s level. Adults often repeat the same syllables and gibberish that they may have heard from the child himself. What parents don’t seem to realize is that the sounds that the baby makes is often the child’s attempt to repeat what he has heard from the adult. Baby talk is also used to refer to body parts and bodily functions that adults themselves may not be comfortable saying out loud. It may be more comfortable for the parent or caregiver to use baby talk than to use the real terms for male and female genitalia or use the actual nouns for what is found in a baby’s diaper or nappy. Baby talk or parentese may sound delightful, but child development experts believe that babies need to hear actual language spoken properly to help them in their own language development. By six months of age, many babies have already been exposed to a variety of sounds that will be the building blocks of their language skills. The use of real words when referring to places, persons, things and actions will help develop the vocabulary of the young child. However, it doesn’t mean that baby talk doesn’t have its own advantages. For one thing, the elongation of vowels and syllables, as well as the exaggeration of speech helps babies hear how these vowels and consonants have to be pronounced. Parentese or baby talk also provides babies the necessary face to face interaction needed to develop language skills. Talking to the baby, even when using baby talk, goes towards the development of the child, both intellectually and linguistically. Finally, when parents and caregivers engage the child, it teaches the baby all about communication. Responding with your own set of cooing teaches the child that he can express his feelings not only through crying but also through babbling or attempting to speak. The next time you interact with a baby, try and see if you can help yourself not speak in baby talk. Chances are, it will be very difficult to do. The minute you lay your eyes on a baby, you’ll want to say, Hewwo, offer him some milky in his ba-ba and as you lay him down to sleep, you’ll probably say, time for beddy-bye.